As I regroup and regain my composure from the excitement I just experienced watching DC Universe’s latest animated movie “Justice League: Doom ,” I will attempt to put into words why I loved this movie. As a kid, I had many favorite animated TV shows, from “He-Man and the Masters of the Universe,” “Transformers,” to “Looney Toons.” But as a huge Superman fan since the age of five, I looked forward to watching “Super Friends” re-runs daily. Although it was cheesy at times, I still couldn’t help myself. It gave my hero Superman the respect he deserved — most of the time. We knew Superman alone could resolve most of the issues that arose, but he would share the load with the rest of the team, as the wise hero and leader he is. With all this Batman craze going on, would they make Superman sit in the sidelines? And since Batman takes precedence on the movie’s cover, I thought they would for sure. But this did not happen. Once again, as with the previous installments of these animated masterpieces — and my old favorite TV shows — they ingeniously spread out the screen time amongst the team, and everyone’s favorites characters get their chance to shine. After all, this is not a Batman and Superman adventure alone. They have Green Lantern, the Flash, Wonder Woman and Martian Manhunter as well as others. Even the villains get plenty of screen time. This movie is actually an origin story for the “Legion of Doom,” the mortal enemies of the Super Friends. And when the Hall of Doom rises from amidst the swamp, it brought all kinds of memories back, and I knew exactly what to expect and what was happening. This was the rise of the Legion of Doom! The story is loosely based on the “JLA: Tower of Babel” comic book story arc. In this story, as well as this movie, Vandal Savage steals confidential files Batman has compiled on each of the members of the Justice League, and learns all of their weaknesses. It is interesting how each superhero’s weakness is explored and exploited. Perhaps all the events that happen here are Batman’s fault — yeah, I said it — but it also gives us the opportunity to see these untouchable heroes hit rock bottom and then recover and rise above their greatest challenges. Once again the art in this latest animated movie is spectacular. I also noticed less CGI than usual. Superman looked great with his classic suit and the Batman suit was as cool as always. Once again, an epic story is told via animation that otherwise would have never been made in live-action. This is what I love and appreciate about all these 13 (so far) DC Animation/Warner Premiere comic-book movies — the possibilities are endless. The story for this movie — although based on the comics by Waid — was written by the great Dwayne McDuffie, who has since passed away. McDuffie did an excellent job fitting so much into the allotted time, and giving all the characters their fair share of screen time. His work will never be forgotten. Another detail that will make this movie stand out for the fans is the voice casting. Once again, Batman and Superman were voiced by the wonderful Kevin Conroy and Tim Daly. 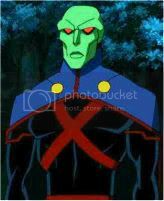 But this time around, they were able to get their hands on Carl Lumbly, who is pretty much the official voice of Martian Manhunter, Michael Rosenbaum, who has also been a favorite for voicing the Flash, and Nathan Fillion as Green Lantern. I remember for the longest time that fans of Fillion wanted him to play the Green Lantern in the live-action film. This is his second outing doing the voice for GL in an animated film and I am happy with his fun interpretation of the character. She has definitely had her share of comic book movie greatness, and with “Doom,” I believe she once again pleases the fans. The movie is fun, action packed and, at times, violent, so parents should be cautioned with this strong PG-13 animated movie. I really enjoyed it and felt it took me back to my “Super Friends” cartoon watching days, as well as the “Justice League” TV shows from the late ’90s to early 2000. If you have already seen it and share my excitement, please chime in at the comment section. ”Justice League: Doom” is available now on Blu-ray and DVD. Tags: "Batman", "Justice League", "Superman", "The Flash", "Wonder Woman"
I saw this movie and was really impressed with the animation, voices and the story-line. It’s one of the better full length features that they have released in a while.